Specialty trips have an additional cost—see dates list below for specific price. 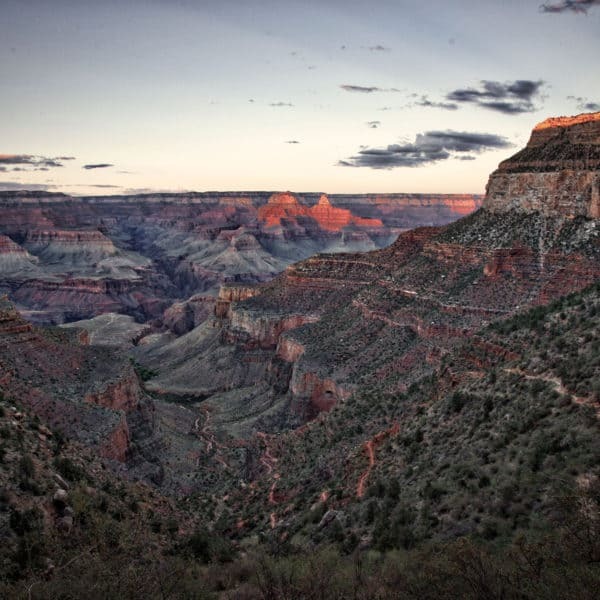 This upper Grand Canyon Classic Adventure requires a beautiful, yet strenuous hike out of the Bright Angel Trail on the last day of the trip. Is this the best trip option for you? 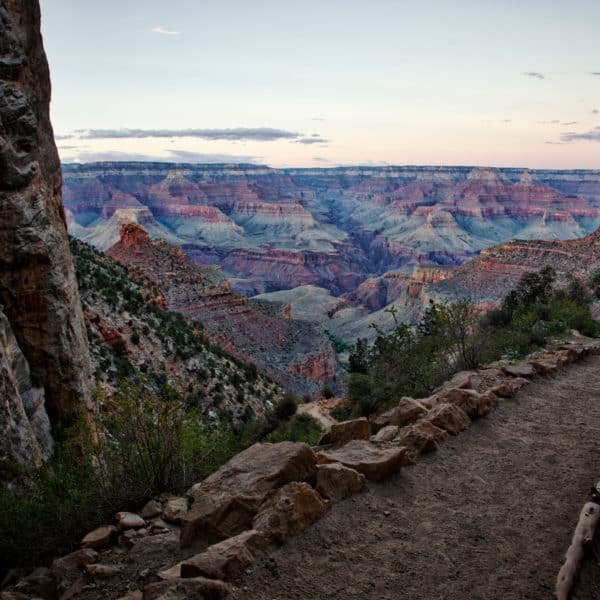 If you and everyone in your party lives an active lifestyle, vigorously exercises multiple times per week, enjoys a physical challenge and hikes often, the Bright Angel Trail will be doable for you. If you’re not currently living this type of lifestyle, the hike may still be doable for you, but you must take it seriously and get prepared. Education is key! The trail is well-traveled by hikers and maintained by the National Park Service, but hiking in Grand Canyon is unlike hiking anywhere else. The Bright Angel Trail is very demanding. 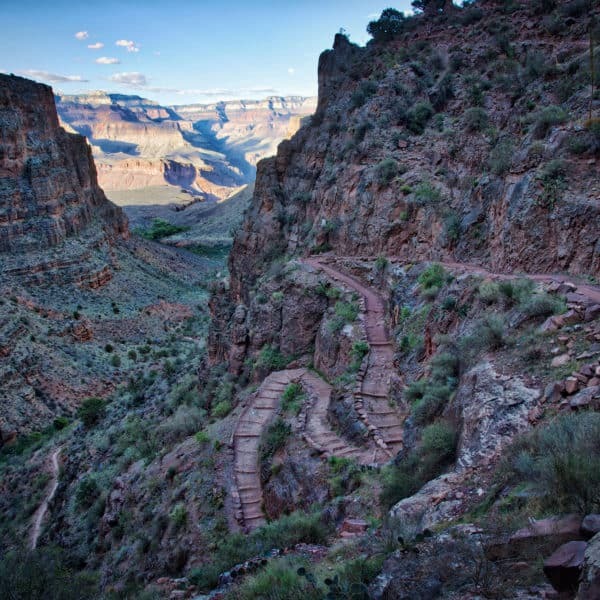 There are various demanding elements along the Bright Angel Trail such as uneven footing, large steps, rocks, ball bearing-like surface conditions and extreme heat exposure. The hike is very doable for most people if you take it seriously, are in good physical condition, pack lightly, stay cool and eat and drink properly along the hike. Be prepared to carry anywhere between 15-25 pounds (6.8-11.3 kg) of your personal gear out of the Canyon with you, as well as 3 quarts of water (weighing approximately 6 pounds or 2.7 kg). Although hiking time varies per person, the average hiker makes it out of the Bright Angel Trail in 6-8 hours. The mule duffel service is an option, but must be reserved for the DAY AFTER YOUR HIKE OUT because we cannot guarantee that we can get your gear to the drop-off location early enough for it to go out the same day. This will require you to stay an extra day and wait to pick up your gear at the mule barn at the South Rim. If you decide to use this service, you will still need to hike out all unreplaceable items, as well as your water and lunch. Whether you use the mule duffel service or not, you should be physically able to carry your gear out. If you plan to use the mule duffel service, reserve it early. Do you have experience carrying a backpack weighing 15-30 lbs? We have a few blog articles on the Bright Angel Trail that we bet will be useful to you, both in the planning process and post-reservation. We recommend that you read through Bright Angel Trail Tips and Bright Angel Trail Etiquette to acquaint yourself with all things related to the “The Big Hike Out”! Join us for our 7 PM orientation meeting the evening before your upper Grand Canyon rafting trip begins at the designated hotel in Flagstaff, Arizona. You’ll meet your fellow rafting team, receive your dry bags, go over last-minute details and learn how to pack your dry bags and what to do with your luggage. This orientation does not cover many river life topics because there are many more orientations while on the river to explain what river life is like! Bright and early, we pick you up by bus at the designated hotel and transport you to Lee’s Ferry. Expect a scenic 2.5 hour drive with a couple of bathroom breaks. At Lee’s Ferry, you’ll unload your gear from the bus, get fitted for a personal flotation device (PFD), meet your crew and begin your adventure! You will disembark on your hike out of Grand Canyon on the Bright Angel Trail sometime between 7 and 9 AM (this time varies significantly from trip to trip depending on many variables). You will repack the contents of your dry bags into your hiking backpack (which we store separately for you) and begin your hike out with your hiking backpack, your provided lunch, some snacks and at least 3 quarts of water. The hike takes on average 6-8 hours, but varies depending on your personal fitness level. When you complete your hike, you will be at the South Rim of Grand Canyon. If you decided to store any luggage with us for the duration of your trip, it will be available for pick up at the Maswik Lodge bell desk. Transportation is not provided back to Flagstaff from the South Rim (transportation details are below). 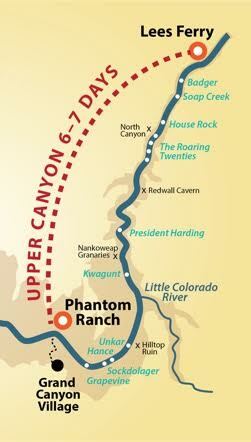 There are many travel options for getting to and from your upper Grand Canyon rafting adventure. The below options have worked best for our rafters. Flagstaff is located approximately 2.5 hours north of Phoenix, at the junction of Interstate 40 and Interstate 17. You may arrange to pick up or drop off a rental car at the Flagstaff Airport. You may leave your vehicle parked at the designated meeting hotel for the duration of your trip free of charge (it is not a secured lot). Or, you may leave your vehicle parked in the backpacker’s parking lot at the South Rim. If you would like a Grand Canyon rafting trip that offers a variety in types of boats, this is the ideal adventure for you! This is a great option for those that would like to both paddle and sit back and relax in the oar boats. The Classic Adventure is also an ideal choice for guests of different abilities and interests, keeping in mind that 6-7 days in the backcountry environment will take its toll on everyone. With a minimum age of 12, this is a fun family expedition unlike any other, where families spend quality time together, unplugged from the outside world. We welcome first-time rafters, experienced rafters and everyone in between. This is our most popular adventure, as the variety of boats offer experiences to excite everyone! We often get asked what the best time of year to raft the Grand Canyon is, and our answers is always, “it depends on what type of weather you prefer!” You’re going to get different weather every month. Some months are more variable weather-wise, whereas others are more reliable. Below is a general guideline as to what type of weather to expect each month in Grand Canyon. April: Average high is 80-85 degrees F (26-29 degrees C), with lows in the mid-50s F (10s C). Rain is possible, though unlikely. Wind is likely. September: Average high is 95-105 (35-40 C), with lows in the upper-60s (18-20 C). Rain is likely at the beginning of the month, but as the monsoon season tapers, expect clear skies and comfortable weather. October: Average high is in the 80s (26-29 C), with an average low in the mid-50s (10s C). Rain and wind is unlikely. Expect shorter daylight hours. Awesome group of people! VERY knowledgeable, professional, organized, and magicians with creating world-class cuisine on the river!! LOVED EVERY BIT OF MY AZRA EXPERIENCE!